Rolex nicknames are a powerful thing that evokes a very clear image of what they’re attached to. So when this new interpretation of the GMT-Master II was presented to us featuring an Everose gold case and a split black and brown 24-hour bezel we were slightly taken aback. The fact that its dial is black can entirely be forgiven, as later examples of the “Root Beer GMT” (reference 16713 for example) were offered with black dials, this black/brown bezel is not the traditional yellow/brown combination that Rolex enthusiasts by and large know and love. Here is the Everose GMT-Master II. This isn’t to say the new version of the GMT in solid gold isn’t a handsome watch. On the contrary, the color combo works well, providing a crisp yet somewhat muted aesthetic. 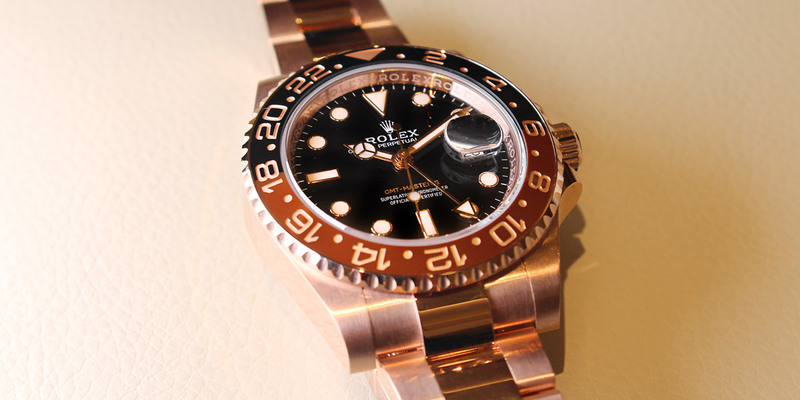 Even the fact that Rolex did not use a contrasting color for its GMT hand works well in this case. If anything, The piece could have been better served with a little more contrast between the two colors on its ceramic bezel to give the piece a little more punch, or alternatively going in the other direction and fitting an all-black or all-brown bezel would have been an equally smart decision. Gripes about nomenclature aside, the big news with this and the parade of other GMT model from Rolex this year is its technically updated caliber—the new 3285. As we’ve noted in other features, the big news is its uprated power reserve, now clocking a solid 70 hours. All told, 14 patents went into the new caliber’s creation, including a new escapement design. Dubbed the “Chronergy Escapement” it still operates on the same principles as your traditional Swiss Lever escapement, though through some retooling of ratios and other details, Rolex managed to eke out a reasonable increase in efficiency. This combined with a rework of its mainspring barrel design are the two key contributing factors that helped Rolex achieve this increase without any compromise to accuracy. 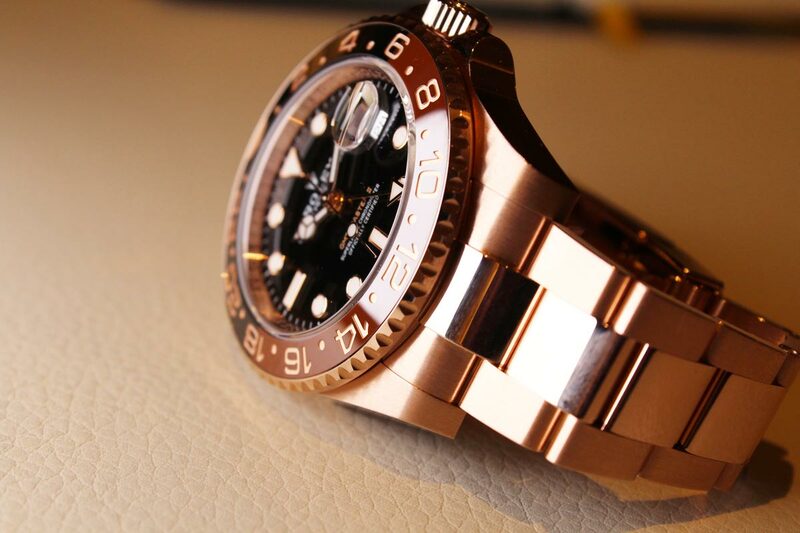 It’s safe to say that the days of a 40ish hour power reserve being acceptable from the luxe watch world’s major players is rapidly coming to a close, and we’re glad to see that Rolex—while note at the forefront of this advancement—wasn’t too late in the game. There is a two-tone version of this Everose GMT-Master II. 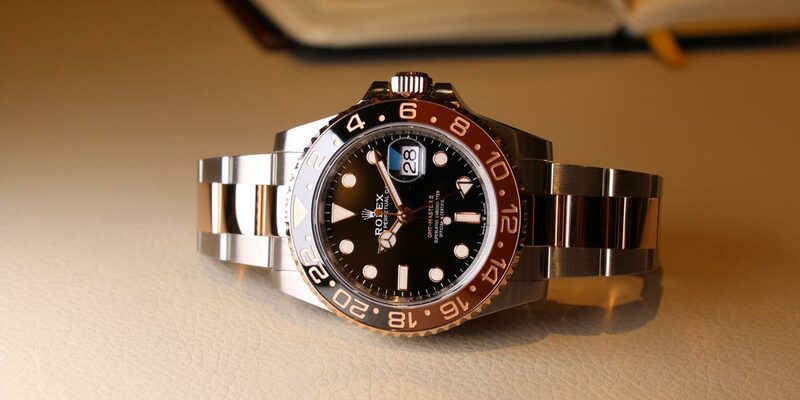 Much in the same way that the black-dialed Rolex Yachtmaster in Everose proved to be surprisingly charming considering its unorthodox color combination, the same can be said for this latest Rolex GMT-Master II once seen in the metal. Again, we would have killed for a little additional contrast between the dark brown and black Cerachrom in its bezel (especially on the solid Everose version), but in trade the new Everose GMT-Master II is one of those rare watches that somehow comes off almost understated regardless of its precious metal construction. Much in the same way that a solid rose gold Patek Philippe Nautilus 5980/1R Chronograph makes a statement without being obnoxious, flashy, or tacky, we suspect the same impression will be made by this new Rollie once they start being spotted out in the wild. From a design standpoint there is a lot that carries forward from previous GMT-Master II models on offer with the older caliber. Its Cerachrom bezel is bi-directional—a logical setup for a GMT—and is still one of the best in the industry in terms of action. It also carries forward the date window cyclops, which is safe to say the piece would look rather odd without at this stage of the game. Finally, though case modification was required in creating this new piece, the GMT-Master II maintains the same 100m water resistance as all its siblings. While not as significant as the water resistance of the new Submariner, 100m is more than enough for any sort of recreation activity you’ll come across shy of proper deep diving. Its GMT complication makes this model an ideal travel companion, and one that you won’t have to take off when you head to the beach or out on other vacation excursions. What are your thoughts on the Everose GMT-Master II? Comment Below. At the end of the day, this Everose version of the GMT-Master II is a bit of a niche execution of the classic model that won’t necessarily have mass appeal. Priced at CHF35,000, it’s not for the faint of heart or pocketbook, but I suspect the fact that it’s going to be less of a mainstream watch is precisely the selling feature that will drive buyers to give it a second look. When it comes to the Rolex catalog there are so many pieces that have become the collection staples, the “must haves”, that Rolex manages to thrive on that outlier clientele that specifically shop for their less conventional offerings (the Yachtmaster II, the Air King, and the Sky-Dweller to name a few). I know if I were in the market for a solid gold Rolex that will turn heads without being all “in your face” about it, this new GMT-Master II would certainly be a contender.